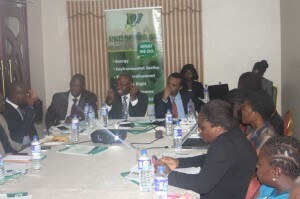 On December 10, 2015, Spaces for Change presented the findings of its scoping study on “Gender and Fuel Subsidy Reform” to an exclusive audience of stakeholders in the Nigerian energy sector drawn from the African Development Bank, National Bureau of Statistics, Oando Petroleum Plc, Trade Union Congress, Petroleum and Natural Gas Senior Staff Association of Nigeria, Environmental Rights Action, energy editors of leading national newspapers, donor agencies, expatriates and staff of multinational oil companies, and representatives of slum women associations in Badia, Lagos. The scoping study is a prelude to a multi-year study conducted by a consortium of researchers in three countries – Nigeria, India and Bangladesh. The research team coordinated by the International Institute for Sustainable Development (IISD) comprises Spaces for Change (Nigeria), Integrated Research for Action and Development (India) and Bangladesh Institute for Development Studies. The presentation featured a webinar session featuring bespoke presentations of the literature review conducted in the three countries as well as the research questions that they will investigate over the next three years. IISD presented an overview of the research methodology and workplan, and the targeted outcomes (2015-2018). The overall research agenda is to help governments design subsidy reforms sensitive to how they will affect women and men differently, e.g. how to redesign or replace subsidy policies and use reform to promote gender equality and empowerment. The scoping report confirms that women’s daily lives and welfare are intimately connected with the availability and use of cooking fuels. Further, these cooking fuels are frequently subsidised, implying that women are indeed directly affected by subsidies in a way that men are not. In Nigeria, only 50 percent of the population have access to electricity in 2014, and curent power generation levels hovers around 4,000MW. As a result of chronic electricity supply shortages, households and businesses depend on petroleum products (mainly petrol, diesel and kerosene) as alternative sources of energy supply to light up homes, carry out basic domestic chores and power the industries that create jobs. Poor access to energy supply contributes to the high levels of poverty and underdevelopment. It also has particular implications for women who are largely responsible for domestic tasks such as cooking and who therefore bear a significant share of the burden of energy poverty. This situation is compounded by lower literacy levels among women, high income inequalities, and higher levels of unemployment. Apart from petroleum products, biomass is used by a large percentage of households, with over 60% of Nigerians depending on traditional biomass fuels, especially fuel wood for cooking and other domestic purposes. Despite huge spending on kerosene subsidies, products are often smuggled to other countries or diverted to black markets resulting in scarcity, and sold at prices significantly higher than the subsidized price of ₦50 per litre. Low-income women who largely depend on kerosene for their domestic energy needs bear the brunt of the product’s scarcity, queuing for many hours to purchase the fuel or forced to resort to traditional biomass. When women spend long hours on fuel and kerosene queues; the time they would have spent on productive activities is lost. The allure of making higher profit margins and meeting the low-cost energy demands of the poor provide motivation to adulterate petroleum products, particularly kerosene. Because kerosene is predominantly used by women for cooking and lighting, they comprise the majority of affected casualties of domestic accidents caused by adulterated kerosene explosions. A study found that in individual events of kerosene disasters that occurred in Lagos in 2001, the female-to-male ratio of the number of people killed/injured is 116-18, and 2500-358 in Edo State as of 2004 respectively. Nigeria attempted to remove subsidy in 2012 and this provoked public outrage. 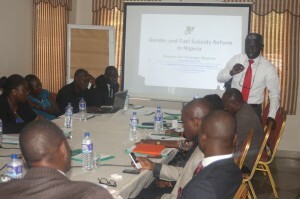 Nigeria is currently under a new leadership determined to resolve the perennial fuel scarcity situation in the country. As subsidy reform is imminent, the impacts documented above help to understand how energy subsidies affect women’s access to, and use of energy. Subsidy cuts in January of 2012 saw the price of petroleum products, especially gasoline, rise dramatically from N65 to N141. Evidence from other developing economies like Ghana, Indonesia and Burundi show that reforming subsidy on petroleum products lead to higher fuel prices. This sort of pricing insensitivity pushes more and more women to resist cleaner fuel alternatives, including cooking fuels such as LPG. LPG consumption in Nigeria is still abysmally low at the rate 170,000 metric tonnes annually as at 2013. Costs of acquiring LPG stoves and cylinders are high. Usually available is the 12.5kg sizes which are sold at a price the poor consider too costly. There is a body of evidence showing that an increase in energy prices of non-transport fuels can lead to changes in the type of energy used, with increases in the price of LPG, kerosene, or electricity encouraging substitution towards cheaper, more traditional energy sources like biomass, charcoal, or dung—see, for example, Vagliasindi (2013) on Morocco, where an increase in the price of LPG led to an increase in the use of wood among the rural poor and charcoal among the urban poor and Lampietti et al (2007) on Armenia, where increases in the price of electricity led to an increase in the reported consumption of wood and natural gas. However, the degree to which households substitute away from modern fuels as subsidies are removed, or the key factors determining the degree of substitution are not well researched. The extent to which subsidy reform in general, and fuel switching in particular affects women is not clear. There is little qualitative or quantitative evidence on this question. So, over the next three years, Spaces for Change and the consortium of researchers will be conducting a rigorous research to understand how subsidies affect the welfare, productivity and empowerment of women in low-income households in urban slums, rural areas and coastal communities in contrasting states across different geographical zones, taking into account the significant variations in the social, cultural and traditional patterns of use and access to these products in different parts of Nigeria. We recognize that subsidies to different fuels operate differently and that not all households can access subsidized fuels. As such, the roles played by women and men in procuring and using energy may differ significantly depending on characteristics such as urban/rural, ethnic identity, religion, geographic area etc. Secondly, the research will also examine how subsidy reform affects women and men differently. This will depend upon the baseline impact of the subsidies; household decision-making that could lead to substitution to lower quality fuels, lower energy consumption or a lower disposable income; and how subsidies compare with other interventions intended to promote gender equality and energy access. In his closing remarks, the co-chair of the session, Mr. Ademola Phillips, the Lagos State Coordinator of the National Bureau of Statistics expressed the agency’s commitment to support Spaces for Change’s multi-year research, especially in the development of survey tools and instruments that will be used to gather information during the field research phase.